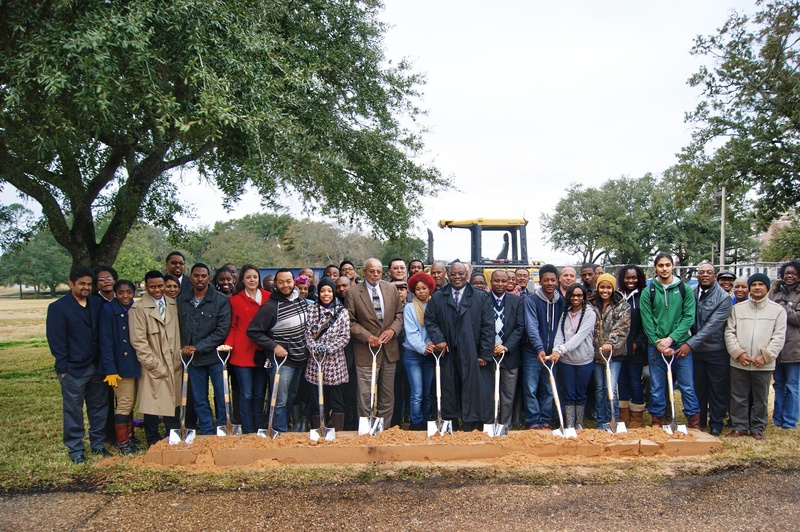 On Thursday, January 23, 2014, the College of Agriculture and Human Sciences (CAHS) and the College of Business (COB) at Prairie View A&M University held an official groundbreaking for a new facility that the two colleges will occupy in 2015. The event was held at Alumni Field next to the construction site. Despite the cold and wet weather, many faculty and students from both colleges came to observe as administrators broke ground for the new building. The ceremony included speeches from students, the two deans of the colleges, and the President of the University. The new building will be an 89,000 square-foot, four-story facility that will be located between Hilliard Hall and the Criminal Justice building. The $37.8 million venture will include a 400 seat auditorium with theater-style seating and executive seating at the front, technology-enhanced classrooms, and a 400 square-foot student lounge on the second floor. There will be large, open areas dedicated to student-professor collaboration. The building will also have a tall, eye-catching clock tower that will extend far above the campus. The building is designed with both colleges in mind. There will be color-coded accents throughout the building to assist students, faculty, and visitors with navigation. Levels three and four will be arranged to give each college its own identity. Agriculture students and faculty will be able to take advantage of new laboratories and office space on these floors. There are plans to install a web camera so that people can remotely view the construction process. The new academic building is just one of several new sites that are being developed for the near future on Prairie View’s campus. The faculty and staff of CAHS are highly anticipating the completion of the new project which is scheduled for 2015. This entry was posted on Monday, February 10th, 2014 at 3:30 pm and is filed under Uncategorized. You can follow any responses to this entry through the RSS 2.0 feed. You can leave a response, or trackback from your own site.